Honestly, I was skeptical at the start. 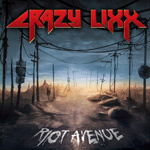 I was skeptical about Crazy Lixx's third and latest effort, Riot Avenue, after the first spin. I think their fans will be happy with it, but this album is not equivalent to the entertaining New Religion. Crazy Lixx:searching for a Big Mac. But it will grow on you. 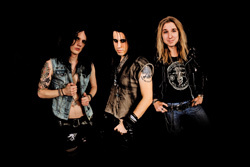 There's seems to be turn to the hard rock side of their sleaze rock roots. Songs like Downtown and In the Night are simply heavier tunes. It's not that melody is absent; Crazy Lixx couldn't do what they do without it. No, Riot Avenue is rougher and raw, which seems to minimize the hooks and grins found in previous material. Even greater evidence comes in Danny Rexon's vocals. He sings less, opting more for something nearing a dialed down screamo. Frankly, with 11 songs on the platter, I'm hard pressed to point one that I like. The possible exception could be the closer Only the Dead Know. It's a fine song, and Rexon shows that he can still sing. I'm not sure what to conclude about Crazy Lixx's Riot Avenue. At the very least it's adequate, but in some ways nearly disappointing. Over time, if I pull it off the shelf, it may improve. Check it out. Crazy Lixx's Riot Avenue left me scratching my head. It's adequate hard rock from the band, but I'm not sure how much I really like it.